Steak Diane is a classical meat dish that to properly be served must be prepared at table side. The presentation of preparing this meat dish is a great way to impress your guests. Normally Steak Diane would be prepared table side by a Captain in a grand hotel dining room. Because this dish comes together quite fast, it is recommend having all ingredients chopped and measured out before starting to cook. Thin tenderloin steak are sauteed with shallots, thyme, mustard, mushrooms, and cream. History: Steak Diane was very popular in the 1950’s and early 1960’s, especially in New York city in upscale restaurants prepared table side with its theatrics arising from the flambéing of the cognac used to make the sauce. It was supposedly named after the Roman goddess, Diana or Diane. Diana was the Goddess of the Hunt and also Goddess of the Moon. Steak Diane was originally a way of serving venison. Working with one piece of steak at a time, place each between two pieces of plastic wrap. Working from the center to the edges, gently pound each piece of steak with a meat mallet to 1/2-inch thick. In a small frying pan (8- or 10-inch) over medium heat, heat 1 tablespoon butter for 1 minute. Add the pounded tenderloin steaks, sprinkle with a little salt and pepper; increase heat to medium-high and sautexactly 2 minutes on each side. Remove them to a plate and chill in the refrigerator for 5 minutes. In a large frying pan over medium heat, melt remaining 3 tablespoons butter; stir in Worcestershire sauce. Place the shallots or green onions, garlic, and mushrooms in the center of the pan with the tenderloin steaks around the edges. Using a spoon, stir and toss the mushroom mixture approximately 2 minutes. Add lemon juice, salt. and pepper. Turn the steaks and add the thyme, chopped parsley, and dried mustard powder. Flambé the steaks: Check out my web page on How To Flambé for hints and tips. Leave the cooked steak in the frying pan; add the heavy cream and chives. Tilt the pan slightly, and pour the brandy or cognac into the front edge of the pan; turn the heat to high and let the flame (or if electric, light with a match) catch the brandy's vapors and ignite it. Swirl slightly, turn off the heat and let the flame go out. 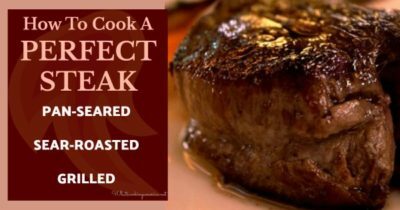 Place steak medallions on individual serving plates and top with the sauce from the pan. Source: Recipe adapted from a recipe by Chef John J. Vyhnanek from his Good Cooking web site.